That's one ugly little spud! Limited to 1,000 pieces worldwide! From Hollywood Collectibles comes the Ghostbusters Slimer 1:4 Scale Statue! 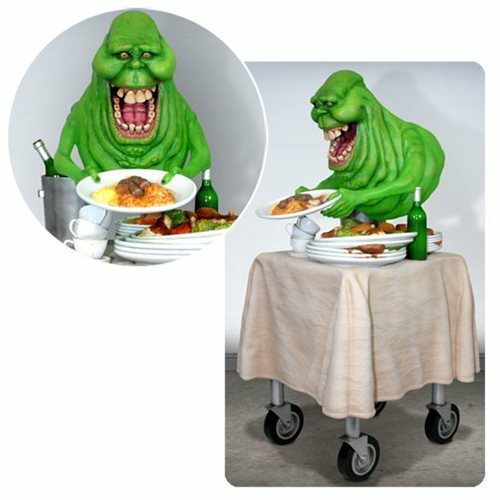 Slimer is depicted hovering over a food cart whilst gorging on the leftovers in true Slimer fashion! This impressive 1:4 scale statue stands about 23 1/2-inches tall on the highly detailed food cart display. Slimer himself is 10-inches tall and is expertly crafted in translucent resin for a more ghostly appearance! This museum quality statue is constructed from translucent resin and heavyweight polystone and then hand painted to the finest detail. Limited to 1,000 pieces worldwide.